Stephen FitzGerald began his professional career as a diplomat, studied Chinese and became a career China specialist. 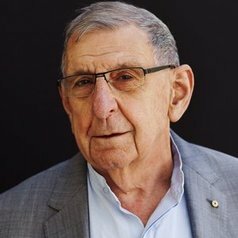 He was China adviser to Gough Whitlam, and Australia's first ambassador to the People's Republic of China, and in 1980 established the first private consultancy for Australians dealing with China, which he continues to run. Since the late 1960s, he has worked for policy reform in Australia's relations with Asia, and for Asian Literacy for Australians. He chaired the 1980s committee of the Asian Studies Association of Australia on Asian Studies and Languages in Australian Education, and the government's Asian Studies Council, which wrote a government strategy for the study of Asia in schools and universities. In the same year, he chaired the government's Committee to Advise on Australia's Immigration Policies, which wrote the landmark report, Immigration. A Commitment to Australia. He was head of the ANU's Department of Far Eastern History and also of its Contemporary China Centre in the 1970s. In 1990 he founded and until 2005 chaired the UNSW's Asia-Australia Institute, dedicated to making Australia part of the Asian region through think-tank activities and ideas-generation by regional leaders meeting in informal discussion. He has been consultant to the Queensland and Northern Territory governments on the introduction of Asian languages to the school curriculum, consultant to Monash, Melbourne and Griffith universities on mainstreaming Asia in university studies, Chair of the Griffith Asia Institute, and Research Strategy Director of UTS's China Research Centre. He has also been a consultant on governance-related aid in China and Southeast Asia, for the Federal and Northern Territory governments, and the governments of Britain, Denmark and others. He has published monographs, reports and articles on the above topics. His current research is on change in Australia's policies and attitudes towards Asia from the 1960s to the present. He is currently a Board Member of China Matters.